You may have the latest iPhone or iPad but do you really know all the wonderful things you can do with it? There are so many different tricks to accomplish that sometimes a good book might help you with some tricks or tips that can bring out the full capacity and power that is at your fingertips. 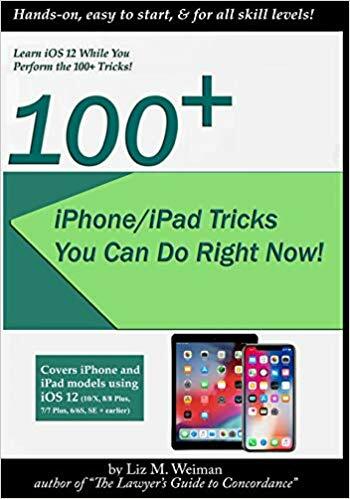 There is a wonderful book by Liz M. Weiman called 100+ iPhone/iPad Tricks You Can Do Right Now! (iOS 12). This book is a treasure trove of amazing things that you can accomplish with your iPad/iPhone if you just look through it and learn more about these devices. For example, did you forget where you parked your car? Use your iPhone to locate your car in a busy shopping mall parking lot. Emergency SOS: Use your iPhone to call 911 when you are in danger and don't have time to up the phone function to dial. Safe shopping apps: Staying safe while shopping on your phone. On your iPad you can connect all of your smart appliances together. Siri can be your translator. You can create a handwritten message when texting. Clear and manage notifications. Record a dictactation with updated voice memos app. Use AirDrop to transfer Passwords. The list goes on and on...it really is a very helpful list of useful tricks and tips that will be useful for many situations and needs. The author, Liz M. Weiman, is the founder of iWorkshop Academy. She has trained thousands of individuals sine early 1990's in computer/digital software and has additionally created web-content, e-learning modules and instructional documentation for Hewlett-Packard, Schlumberger, and other Fortune 500 companies. Ms. Weiman has been an instructor in Macintosh, iPad, iPhone, Apple Watch and PC systems at The Women's Institute of Houston for the past 15 years. A Houston, Texas native who graduated from Boston University, she has worked as a journalist, editor, instructional designer, technical writer, instructor, documentation project manager and author. Weiman is also the author of The Lawyer's Guide To Concordance, published in 2010 by the American Bar Association. 50+ iPhone/iPad Tricks You Can Do Right Now (iOS 10) (2016) and 80+ iPhone/iPad Tricks You Can Do Right Now (iOS 11) (2017). This would make a great holiday gift for someone who is really into their iPhone or iPad and loves to learn new tricks or tips about using it. Or, for someone who is new to the iPhone or iPad and needs to learn how to navigate the device. Either way, it makes a great gift for just about anyone who likes to learn how to use these devices. The book is easy to read, has excellent instructions and is extremely easy to follow along. 100+ iPhone/iPad Tricks You Can Do Right Now! (iOS 12) is available in trade paperback at bookstores nationwide, such as Barnes and Noble and online at www.amazon.com and www.barnesandnoble.com.